A large part of the whole gardening process is disappointment. Things you plant never grow; seeds you buy never germinate; things you never wanted in the first place – take over and choke out the plants you did; insects and pests ravage your hard work. 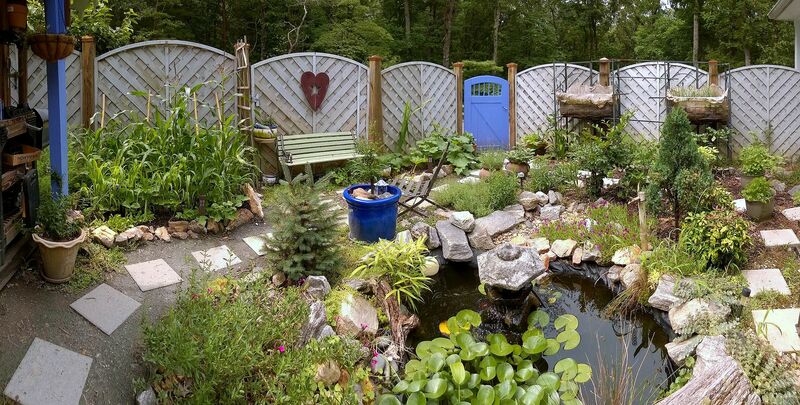 However, every so often you do get a bonus – Volunteer plants. Volunteers are seeds that were carried in on bird poop, or blown from your neighbors garden, or some seed you planted years ago that finally received the proper amounts of water / dirt / light / fertilizer… whatever – to dig in and make a stand. And poking around this morning during my weeding, I found I’ve got several upstarts that I didn’t know were there. Since the list started to grow rather rapidly, I’m breaking the article into 2 parts. Okay, I’m going to upset a couple of botanist out there. Creeping Cucumber (Melothria pendula), or Guadalupe Cucumber is a perennial vine that grows throughout the Southeastern States. It can be aggressively invasive due to redistribution of the seeds by mice and birds. It produces a small watermelon shaped fruit about the size of a jellybean. And yes… it tastes like a cucumber. Here’s the thing – and I am serious as a heart attack about it – you can ONLY eat the fruit when they are pale to solid green. Once the cucumber begins to mature (ie. turning yellowish to dark purple) they become toxic. Got that? TOXIC. Once Melothria pendula has matured, the fruit becomes a powerful laxative… as in – one fruit will evacuate a horse in about 15 minutes. So, yes it makes an attractive vine. Yes, it can be edible if you follow the instructions. Yes, it will make you wish you were never born if you ignore what I just said. A member of the Oxalis family. Wood Sorrel (or Sourgrass) is an perennial in which all parts of the “above ground” plant are edible. The seeds, flowers and leaves have a decided sour taste from oxalic acid – making them a nice addition to a summer salad. Be advised – if you suffer from kidney problems or stones, you’d best leave wood sorrel alone as it can aggravate those situations. We have 2 varieties growing here. The Purple (or red) variety, which has a tougher structure and tends to grow closer to the ground; and the green variety, which has a habit of working it’s way in and around other plants – growing upwards of 18″. I tend to pull up the green variety as it looks unruly and “weedy”. Fair warning, unless kept in check, any and all wood sorrel will take over untended areas. I usually allow the purple to grow in areas that I’m not too keen on weeding – they do have a habit of choking out the competition. 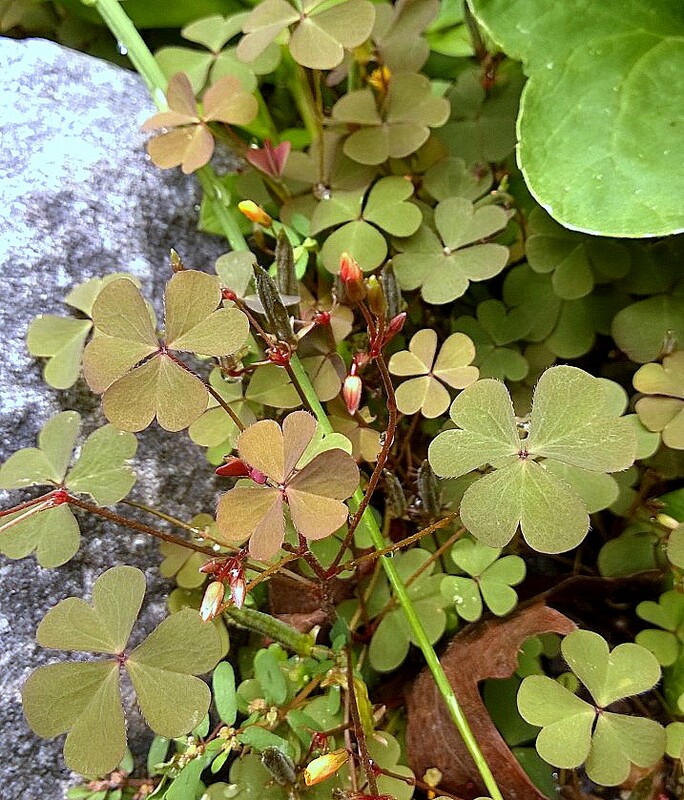 You can read more about Wood Sorrel <HERE>. Yarrow is thought by many to be a troublesome weed. It creeps and snakes it way through the flower beds and gardens on finger roots, while copious seeds are easily germinated. Me? I kinda like it. I admit, I buy the cultivated varieties and plant them around the gardens because they have long lasting, interesting color profiles – ranging from smoky blue to strawberry red. But the common yarrow is typically white. 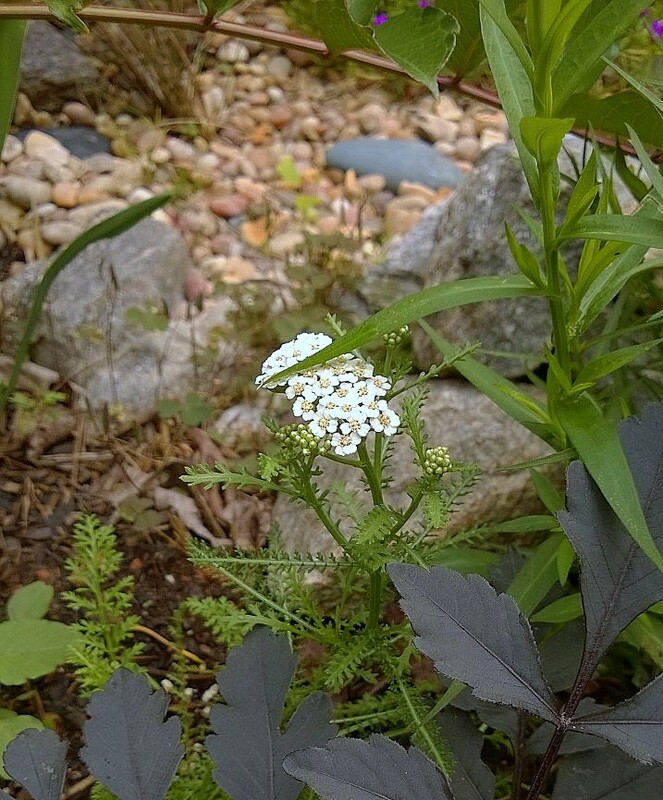 Yarrow is a medicinal herb, the musky aroma of the leaves and flowers making a pain-relieving tea. The roots can be steeped to cure the common cold…. or so I’m told. All in all, if you’re vigilant in your garden, you can keep it in check, and what’s better than a flower you didn’t have to buy seeds or plants for – that comes back every year. You can read more about yarrow <HERE>. Tomorrow we’ll look at the vegetable volunteers. That creeping cucumber looks like what I have growing in my lilac bushes. Does it grow in Minnesota, do you know? There is Echinocystis lobata (Wild Cucumber) that grows in Minnesota. Different weed. I believe it is still edible. You can check with the Minnesota botanical groups for a better idea of it’s edible status. This is part of the dual posting between here and “A White Plate”. You’ll need to follow the – View Original – link at the bottom of the post to read the article in it’s entirety.